Why would anyone want to visit Antarctica? It's the coldest, windiest, and driest place on earth. The tourist season is a scant four months long. There are no shops, piers, idyllic beaches, or tourist venues at the Antarctic ports of call. The ocean crossing from South America, Africa, or Australia is almost always a rough one. A mysterious continent, people often misunderstand or don't know many things about Antarctica. Despite all of these perceived negatives, Antarctica is on many traveler's lists of "must see" destinations. Those who love to cruise are lucky since the best way to visit Antarctica is via cruise ship. Since most of the wildlife in Antarctica is found on the ice-free narrow ridges of coastline around the islands and mainland, cruise passengers don't have to miss out on any of the interesting sea, land, or air creatures of this exciting continent. In addition, Antarctica has no tourism infrastructure such as hotels, restaurants, or tour guides, so a cruise ship is an ideal vehicle for visiting the White Continent. One note: You won't get to the South Pole on a ship. Unlike the North Pole, which lies in the middle of the Arctic Ocean, the South Pole is hundreds of miles inland, situated on a high plateau. Some visitors to the South Pole have even experienced altitude sickness. Although 95 percent of Antarctica is covered with ice, there are rocks and soil under all that ice, and the continent is twice the size of Australia. Antarctica has the highest average altitude of any continent with over half of the land 6,500+ feet above sea level. The highest peak on Antarctica is over 11,000 feet. Since Antarctica gets fewer than four inches of precipitation a year, all of it in the form of snow, it qualifies as a polar desert. Cruise ships visit the Antarctic Peninsula, a long, finger-shaped piece of land that stretches towards South America. Ships can reach the Shetland Islands and this Peninsula in about two days of crossing the Drake Passage, one of the world's most infamous sections of the open sea. The ocean surrounding Antarctica is one of its most interesting features. The winds and sea currents interact ferociously, causing this area of the ocean to be very turbulent. The Antarctic Convergence is the region where the warm, saltier waters flowing south from South America meet the cold, dense, and fresher waters moving north from Antarctica. These conflicting currents are constantly mixing and result in a very rich environment for an abundance of sea plankton. The plankton attracts large numbers of birds and sea mammals. The end result is the famous rough seas of the Drake Passage and Tierra del Fuego and the thousands of fascinating creatures that survive this inhospitable climate. Those cruising in the same latitudes on the other side of the world south of Australia and New Zealand also have famous rough seas; it's no wonder they are called the "furious fifties" after the latitude. The tourist season is only four months long in Antarctica, from November to February. The rest of the year is not only very cold (as low as 50 degrees below zero) but also dark or nearly dark most of the time. Even if you could stand the cold you couldn't see anything. Each month has its own attractions. November is early summer, and the birds are courting and mating. Late December and January feature hatching penguins and baby chicks, along with warmer temperatures and up to 20 hours of daylight each day. February is late summer, but the whale sightings are more frequent and the chicks are beginning to become fledglings. There is also less ice in the late summer, and the ships are not as booked up as earlier in the season. Although explorers have sailed Antarctic waters since the 15th century, the first tourists didn't arrive until 1957 when a Pan American flight from Christchurch, New Zealand landed for a short time at McMurdo Sound. Tourism really picked up starting in the late 1960s when expedition tour operators began offering trips. The past few years, about 50 ships have carried tourists into Antarctic waters. Almost 20,000 of these tourists land ashore in Antarctica and thousands more sail in Antarctic waters or fly over the continent. Ships vary in size from fewer than 50 to more than 1000 passengers. The ships also vary in amenities, from basic supply vessels to small expedition ships to mainstream cruise ships to small luxury cruise ships. Whichever type of ship you choose, you'll have a memorable Antarctic cruise experience. One word of caution: some ships do not allow passengers to go ashore in Antarctica. They provide wonderful vistas of the spectacular Antarctic scenery, but only from the deck of the ship. 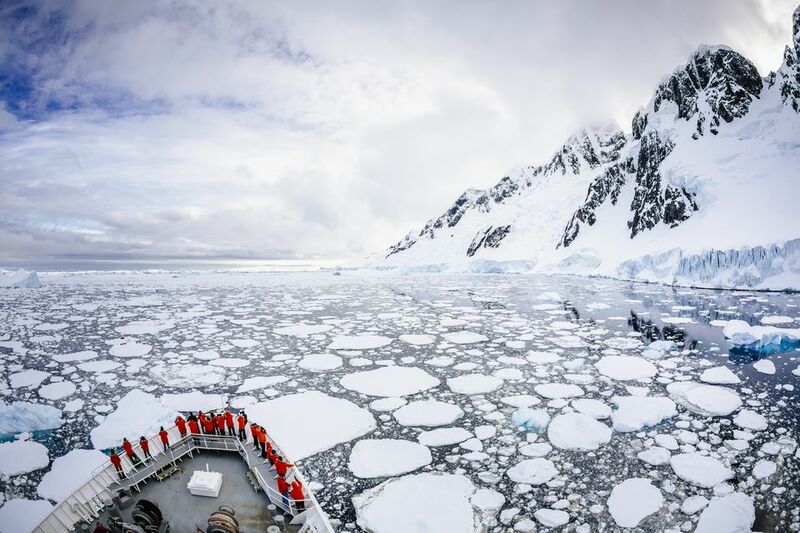 This "sail-by" type of Antarctic cruise, often called an Antarctic "experience," helps keep the price down, but can be a disappointment if landing on Antarctic soil is important to you. The signers of the Antarctic Treaty of 1959 and the members of the International Association of Antarctic Tour Operators do not allow any ships carrying more than 500 passengers to send passengers ashore. In addition, the ships cannot send more than 100 persons ashore at any one time. Larger ships cannot logistically meet this pledge, and any cruise line disregarding it would probably not get a permit to sail to Antarctica again. More than four dozen ships visit Antarctica each year. Some carry 25 or fewer guests, others carry over 1,000. It's really a personal (and pocketbook) preference as to what size is best for you. Visiting a hostile environment involves good planning, so you should do your research and talk with a travel agent before booking your cruise. Although ships carrying over 500 guests cannot land passengers ashore in Antarctica, they do have some advantages. Larger ships normally have deeper hulls and stabilizers, making the cruise a smoother ride. That might be very important in the rough waters of the Drake Passage and South Atlantic. The second advantage is that since these ships are larger, the fare may not be quite as high as on a smaller ship. Also, traditional cruise ships also offer amenities and onboard activities not available on smaller expedition ships. It's a decision you must make, how important is it to step on the continent and to see penguins and other wildlife up close? For those who want to "touch down" in Antarctica, many of the smaller ships have either ice-strengthened hulls or qualify as icebreakers. The ice-strengthened ships can go further south into the ice flows than a traditional ship, but only icebreakers can venture close into shore in the Ross Sea. If seeing the famous Ross Island explorers' huts is important to you, you might make sure you are on a ship that is qualified to traverse the Ross Sea and includes it in the itinerary. One disadvantage of icebreakers is that they have very shallow drafts, which makes them ideal for sailing in icy waters, but not for sailing in rough seas. You will get a lot more motion on an ice breaker than a traditional ship. For those worried about seasickness or price, larger ships carrying less than their normal capacity can be a good compromise. For example, the Hurtigruten Midnatsol carries way more than 500 cruise guests and ferry day trippers during her summer schedule of Norwegian coastal voyages. However, when the ship moves to Antarctica for the austral summer, she transforms into an expedition ship with less than 500 guests. Since the ship is larger, it has less rocking than smaller ones, but still has more onboard lounges and amenities than a tiny ship might. There are no cruise ship docks in Antarctica. Ships that take passengers ashore use Rigid Inflatable Boats (RIBs or Zodiacs) powered by outboard engines rather than tenders. These small boats are ideal for the "wet" landings on the undeveloped shores of Antarctica, but anyone with mobility problems might have to stay onboard the cruise ship. The Zodiacs normally carry from 9 to 14 passengers, a driver and a guide. Most ships traveling to Antarctica start in South America. Ushuaia, Argentina, and Punta Arenas, Chile are the most popular embarkation points. Passengers flying from North America or Europe pass through Buenos Aires or Santiago on their way to the southern tip of South America. It's about a three-hour flight from Buenos Aires or Santiago to Ushuaia or Punta Arenas and another 36 to 48 hours of sailing from there to the Shetland Islands and more to the Antarctic Peninsula. Wherever you embark, it's a long way getting there. Some cruise ships visit other parts of South America like Patagonia or the Falkland Islands, and others combine a cruise to Antarctica with a visit to the island of South Georgia. Some ships sail from South Africa, Australia or New Zealand to Antarctica. If you look at a map of Antarctica, you can see that it is quite a bit further from those locations to the continent than from South America, which means the trip would involve more sea days. Anyone who has a sense of adventure and who loves the outdoors and wildlife (especially those penguins) will have the cruise of a lifetime when they visit this White Continent.